For the Forerunner weapon, see Forerunner automated turret. 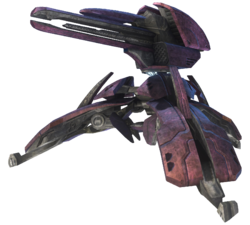 The automated plasma turret is a Covenant weapon emplacement that is often used to defend prefabricated bases and other strutures. There are at least two models of the turret, the larger of which has three further variations. The three major versions of the heavy automated turret. This model features a large, semi-circular base, in the middle of which is an anti-gravity platform like that of the Shade series. The turret, which is built around a Class-2 directed energy cannon, rests on the field emitted by this platform. Three variations of this turret exist, each of which is successively larger and more durable and has more powerful weaponry. In addition to the standard plasma cannon, each iteration of the turret can be outfitted with a fuel rod cannon for increased effectiveness against ground vehicles, a plasma mortar for combating infantry, or a heavy needle cannon for engaging aircraft. The third iteration of heavy automated turret bears a noticeable resemblance to a Sangheili's skull. A light automated plasma turret on Snowbound. A motion detector used by the light automated turret on Snowbound. An in-game preview of a motion detector on Snowbound in Halo 3. Concept art of the heavy automated turret. 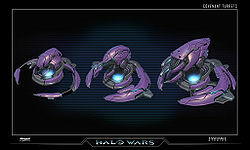 Concept art of several Automated Plasma Turret variants in Halo Wars. Concept art of a Covenant plasma turret on a Vampire in Halo Wars. SPARTAN-IV Commander Sarah Palmer fighting a Covenant APT in Halo: Spartan Assault. ↑ Though the ability of the turret's plasma cannon is likely due to gameplay mechanics, the article assumes that this ability is indicative of the weapon's power.